I just got a heads up from a reader telling me that a biography on the famous monster hunter, Tim Dinsdale, has just been published. 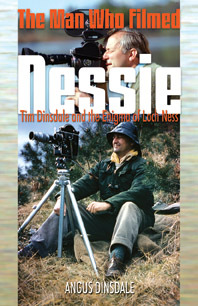 Entitled, "The Man Who Filmed Nessie", it is written by one of his sons, Angus. "The story of the dedicated family man who left his successful career as an aeronautical engineer to search for proof of the existence of the Loch Ness Monster." I have just been reading Dinsdale's "Project Water Horse" and his son, Angus, was certainly involved with his dad's work - even as a young lad. No doubt he will have many interesting things to say about this seminal character in the story of the Loch Ness Monster. I will review it once my order arrives. While I am here, an old favourite has appeared on YouTube ... look out for Tim Dinsdale!